WHY NOT USE THE HANDY VAN? The Handy Van team provide a wide range of services throughout Taunton, with removals, collections and deliveries available for our clients. Having completed many removals in the past, we will always collect your items on time and transport them safely, ensuring they arrive quickly at your new location. Being located in Taunton, we will give all clients a fast response, allowing removals and deliveries to be completed quickly. Our team will also assist with your house clearance, packing all items and safely storing them in our vehicles. Once a collection is completed, delivery is available to any location, allowing you to relax and have peace of mind over the transport of your belongings. We understand just how stressful moving home and location can be, no matter how far you are travelling. There is no limit to the number of items we can collect and removals will always be completed at the highest standard. A friendly and professional removals service is always delivered by our team as we aim to make this process as simple as possible for our clients. Both our handlers and drivers have several years of experience, meaning your belongings are never at risk of being damaged. Whenever you are moving to a new location, regardless of having excess items in your property or looking at new accommodations, professional removals should always be used. This prevents you having to make several trips with your belongings, allowing you to easily and quickly move into a new property without any complications. Our removals service saves every client a lot of time when moving home and allows you to move into your new accommodation without any delays. We can always organise a suitable time to complete removals, pack your belongings and begin transporting. With our vehicle, there is plenty of room to store several items and multiple trips can always be made if this is necessary. No matter how long or short your travel is from Taunton, our removals are available. We are fully trained and qualified to complete a comprehensive removals service in Taunton. Your removal requirements will always be discussed well in advance, ensuring our collection time is perfect and there is no delay in moving location and accommodation. Our removals are always carried out professionally, ensuring we do no damage to your current property and can remove excess items if this is all you require. 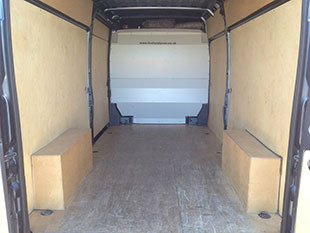 The Handy Van offer a wide range of services and will always leave clients fully satisfied with our removals. No matter what services you require or the scale of removals, we can meet your needs. In addition to our home and workplace removals, we also offer the collection and delivery of any items, whether this is to or from your location in Taunton. We understand how to transport all goods safely and quickly to assure our clients that they will arrive at your location on time. If you would like goods collected from one location and delivered to another on a regular basis, this can be organised to regularly transport your goods and items. By offering same day collection and delivery depending on your locations, a quick delivery can be completed for any companies or for personal use. We can also cater for large bulk deliveries, ensuring no orders are too big for our team. Responding to enquiries around the clock, you can gain a quick response from our team regarding any enquiries, organising a fast collection of your items to be delivered anywhere across the UK. Taunton is a large town located in the county of Somerset, with a population of over 69,000 people. With religious and military backgrounds from over 1,000 years ago, Taunton is a very historical location and is currently undergoing a redevelopment of its town centre. Transport in and out of Taunton is very easy for our team, with the M5, A38 and A358 all being located nearby. As we are in Wellington, a quick response can always be given for removals, collection and delivery in Taunton. As the third largest town in Somerset, Taunton is home to many landmarks that are perfect for both locals and visitors in the area. Some of the biggest landmarks and attractions located in Taunton and the surrounding areas include Quantock Trekking, The Museum of Somerset, Vivary Park, Hestercombe Gardens, Fyne Court and Bishops Lydeard Railway Station. There are many other points of interest also located in Taunton, making it a great area to visit and work in. 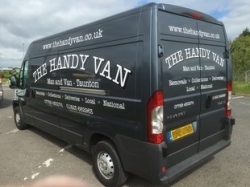 Since being established, The Handy Van have always provided our services throughout the Taunton area. Being located in Wellington, a quick response is always given to clients located in Taunton, ensuring you always have a team for removals, collection and delivery. We can schedule and book our services at a suitable time for each client without any hassle and we will always arrive on time to your location and transport items safely and quickly to meet the needs of all clients from Taunton. We aim to make ourselves an easy choice for all clients in Taunton, being available around the clock to answer your enquiries and provide immediate collection and delivery services at a suitable time. We aim to be the first choice removals company for all clients in the Taunton area, offering the highest standard of service to all clients and always meeting your expectations. Our service will always be completed with fantastic professionalism by our friendly team, putting your mind at ease. Since our establishment, we have built a fantastic reputation for all removals, collections and deliveries in Taunton. Offering the highest level of service no matter what requirements you have, we look to continue growing our reputation and be the first choice for all clients. No job is too small or large for our team, meaning you can relax knowing all items and goods will be transported safely and on time to its destination. You can always depend on our team for a fast and efficient service. As well as offering speedy repairs to deal with any emergency deliveries or removals you require, we can schedule our clients well in advance to prevent any delays or errors when moving items. Arriving on time to your location, all goods will be transported quickly and remain in great condition, being stored in our vehicles very carefully to avoid any problems during our service. If you would like to book the removals, collection or delivery of any items in the Taunton area, do not hesitate to contact The Handy Van. Our team are happy to answer any enquiries, ensuring our service is booked correctly and there are no delays to our services. For more information, call us on 01823 662963 or 07788 450274 or fill in our contact form for a fast response and quote.